Fresh off a morale boosting outing in Greece, Uganda’s leading female kickboxer, Patricia Apolot hopes to make lighter work of Austria’s Carina Greimel when they face-off this Saturday (May 13, 2017) at the MTN Arena in Lugogo. Apolot defeated Greece’s Katerina Abdalla during the European Championships held at the Greek resort town of Santorini from May 1 – 7, 2017, and in the process retained her International Title. She returns to the ring this weekend in Kampala aiming to defend her Intercontinental Title against another European, Greimel. The HimaCement sponsored Apolot who has six international titles to her name stopped Egypt’s LakrechYosrah in the second round to capture her maiden African title on December 2, 2016 during the inaugural Reign of the Giants tournament. 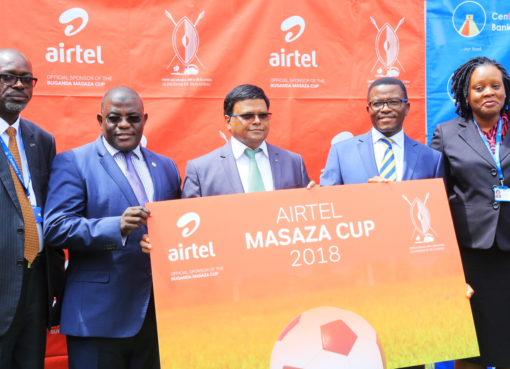 Speaking during a press briefing today, Charles Mugasa, the Marketing Manager at Hima Cement said that the company would continue to support the development of sports in the country. 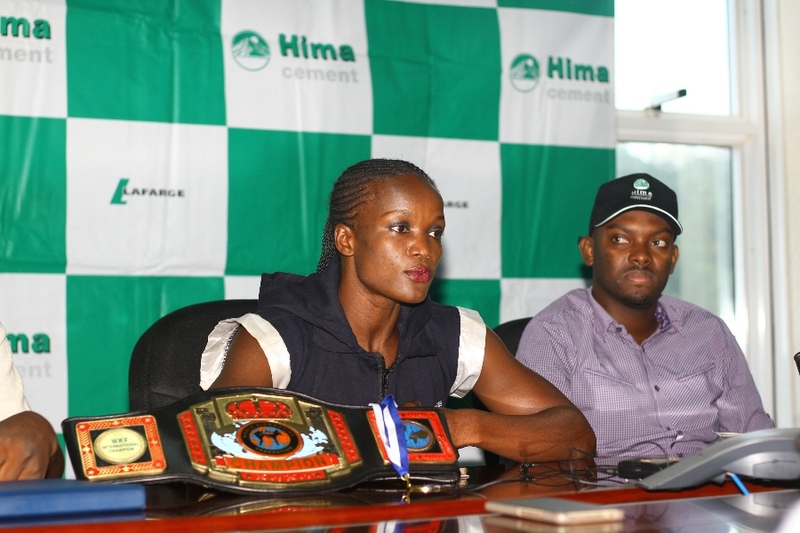 “As Hima Cement, we made a deliberate decision to support the development of sports because when sportsmen and women shine, the national pride is enhanced. Our promise is that we shall continue to stand by Patricia Apolot, the ‘Black Pearl’ in her quest for regional, continental and international glory,” he disclosed. Beaming with confidence, the 25-year-old says she has been training very hard for the bout and promised not to let her Ugandan fans down. “I have been training very hard and this being the third time I am defending my title, I am only waiting for the bell to go off. I know she (Carina) is a good fighter; I watched her while I was in Europe and noted we had similar fighting styles. I know we shall give you a very good fight,” she stated. Christened the ‘Black Pearl’ for her well-calculated moves while in the ring, Apolot who successfully defended her International title in Greece will be hoping to defend her Intercontinental title this weekend. “It has been a hectic schedule but my coach and I are determined to see to it that all these titles are retained. I have great confidence in my abilities and with God’s grace, I will make it. 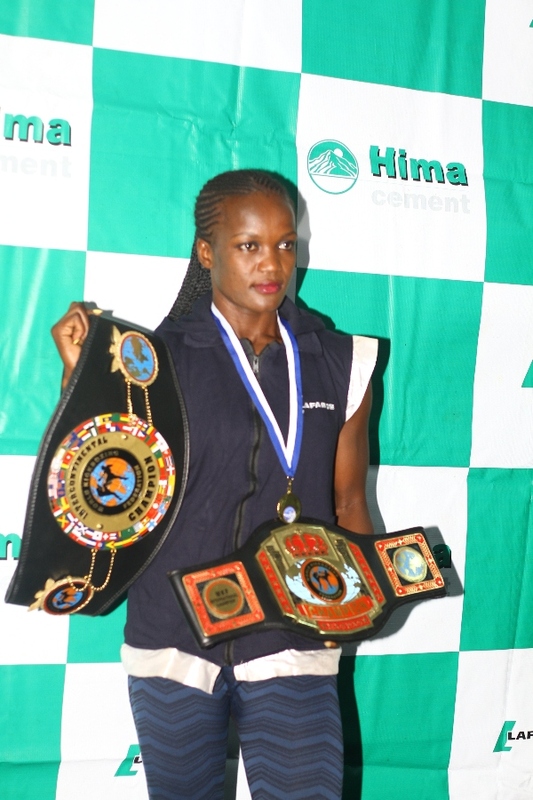 I thank Hima Cement who are my sponsors, my coach and trainers as well as my sparring partners,” Apolot said. She will be travelling to Hungary in June 2017 for yet another international fight. Her plan also includes a fight in August 2017 in her homeland, Teso. Reign of the Giants 2, the fight that takes place at the MTN Arena in Lugogo also has other mouthwatering ties lined up. Alex Matsiko and Shakey ‘Breaker Breaker’ Mubiru will also be fighting for titles.